I try to avoid political commentaries at the time of the Solstices and the Equinoxes. However, the issue if Brexit is of far-reaching consequences. 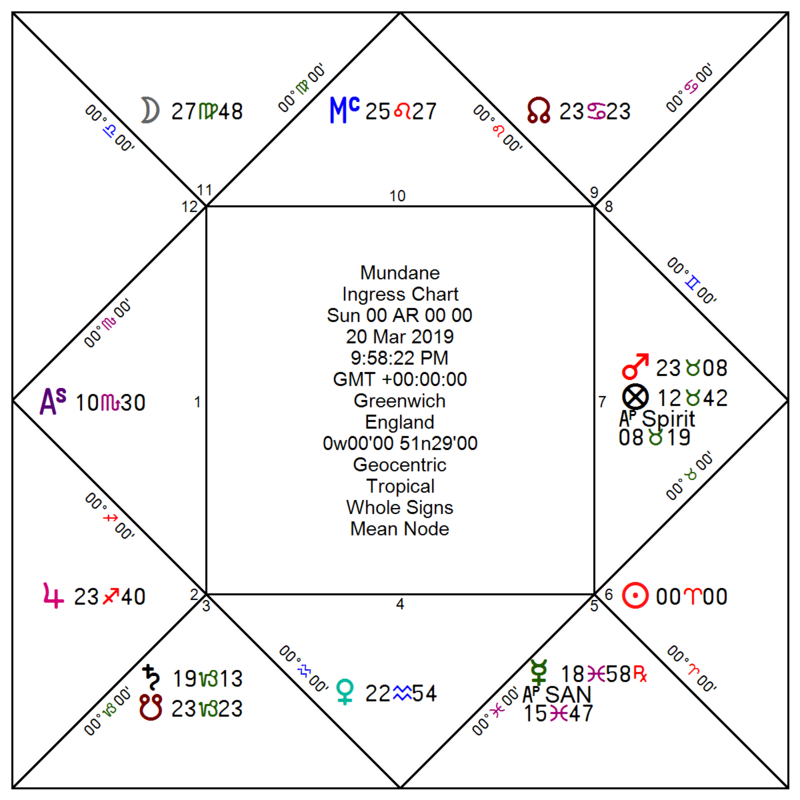 This Vernal Equinox Chart is set for Greenwich Mean Time, in part due to to the proximity of the triggering Brexit Article 50,, set for March 29. 2019. The Moon is in the14th Lunar Mansion, Al Simak (The Harvest)-Interestingly Theresa (May) means harvester. In any case, I take her to be the Moon. May is considered by many to be among the very worst PMs in British history. Her indecisiveness has caused one crisis after another and Brexit has been at the centre of this. Now, it seems that the situation changes by the hour as the PM tries to pass one unpopular and ill-conceived motion after another. The Speaker of the House, John Bercow, has stated that no further votes can be made for an agreement that is not significantly different than the ones already rejected. This adds up to a Constitutional crisis that could be avoided by simply following the pas already made. May was a “Remainer” who said she would lead the UK out of the EU in any case and won an election on that premise. One would prefer a more constant leader at the helm during such a momentous transition. Her method has largely relied on postponing until she gets the answer she wants, which never happens.. The Moon is the Hyleg of the chart and well situated in the 11th house. and in a Nocturnal chart. She is in Hayz. Luna is the Lady of the Geniture, thus of the Year. She also disposits the Node in the 9th House, the house, among other things of Foreign Affairs, which in turn will influence what happens in the Tenth House and MC in Leo. This is important because of the relationship between the King or Queen of the people is part and parcel of what has been negotiated. The Sun is in his Exaltation in the House of the ‘common people” and poised to oppose the Moon when she enters tropical Libra. See the video feed of this phenomenon below. Mars is the chart Almuten and Lord of the Ascendant. The opposition reflects the chafing and divisiveness of this political process. However, Mars is also Lord of the Ascendant. Mercury is responsible for communication and particularly legal and diplomatic agreements or disagreements. In this chart, he languishes in the Fifth House, in his Fall and Rx. The many conflicting elements make this a difficult prediction and not least because of the many versions of Brexit on the table. I believe that May will procrastinate and look for extensions to the exit date by lobbying the EU. However, all members of the EU would have to agree on an extension before the deadline of March 29. If that date is reached without an acceptable agreement and/or an extension, then the UK will leave the EU on that date and revert to the WTO protocols. BBC states that “A no-deal Brexit would mean the UK leaving the European Union and cutting ties immediately, with no agreement at all in place. If MPs do not approve Theresa May’s deal, and there is no alternative deal or move to delay or stop Brexit, the UK will leave with no deal on 29 March. The UK would follow World Trade Organization rules to trade with the EU and other countries while trying to negotiate free-trade deals. ” See Brexit. Returning to Lady Luna in the 14th Mansion of the Moon, this has to do with separating the wheat from the chaff. This is recognized as a good time to end relationships and a very bad time to cling to situations for fear of change. In this particular instance that encapsulates what Theresa May needs to do. Her position is highly compromised, considering the dire condition of Mercury which deposits the Moon. . Finally, we have a highly dignified Jupiter in the 2nd House. In Mundane Astrology, the 2nd House is like the collective pocket – what one owns – ruling finances. The 2nd house rules wealth, possessions and property of the people as a whole. Moreover, it rules our collective values. The UK is strong in all these areas. There are no overwhelming factors in this chart that would prevent Brexit from occurring. As in all great political and public events, decisions are made by any number of people, even in non-democratic nations. The causes and conditions are favourable for a ‘hard Brexit’ and most are wary of the endless machinations, dissembling and indecisiveness which is undermining many elements of the UK. George Galloway has shrewdly stated that “17.4 million people voted for Brexit and are being denied it. That sounds like a recipe for civil war to me and the British rulers should remember what happened as a result of the last one. ” See RT Article. In sum, I would say that delaying the hard Brexit deadline will be dismissed at considerable cost to the PM and the Government at large. All indications show that this is exactly what they will do. Considering the potency of open enemies as described in the Seventh House, combined with May’s weak support, could very well trigger a vote of non-confidence. This Spring Equinox is cause for celebration all over the world in many different ways, but the themes are always around new life and fertility. Take some time to savour this time and enjoy the spectacle of the Equinox Supermoon. This entry was posted in Ancient Astronomy, Aries, Full Moons, Hayz, Traditional Astrology.